And here’s a few cocktail recipes! Rosé may be the unofficial drink of summer, but its pink hue actually lends itself perfectly to Valentine’s Day. 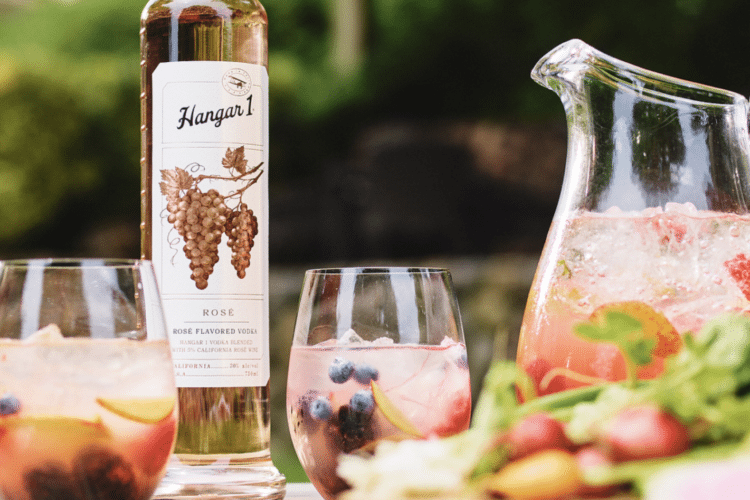 If you’re looking for something a little different to indulge in this holiday, check out Hangar 1 Rosé Vodka, a “blend of ultra-premium vodka and real California rose wine” which is distilled near Northern California wine country. This pink drink smells “floral with notes of honeycrisp apple, sweat pea blossoms and a hint of oak” and tastes “silky and soft, with notes of berry and wood, and a crisp acidity,” according to the spirits purveyor Reserve Bar. This vodka is 80 proof, so keep in mind that you are drinking something with the alcohol content closer to a standard vodka than a glass of wine. However, folks over at Bon Appetit had a sample and reported that it does, in fact, taste like rosé. Hangar 1 Rosé Vodka sells for $32 a bottle and can be bought online. You can also use this locator to see if it’s sold in a store near you. If rosé is not your style, Hangar 1 makes some other intriguing-sounding flavored vodkas, including Mandarin Blossom Vodka, Buddha’s Hand Citron Vodka and Makrut Lime Vodka. The company recommends enjoying rosé vodka on the rocks or in a cocktail such as a spritzer or sangria. However, if you prefer to “rosé all day” without the vodka, there are plenty of other ways to winterize the pink wine. Rosé can even be enjoyed mulled. Check out this recipe for mulled rose & Whimsy (a type of liqueur) from Drinking with Chickens. It sounds even better than that hot chocolate wine everyone was buzzing about last year! For another delicious Valentine’s beverage, mix up this bubbling Love Potion cocktail with some bourbon-infused chocolate-covered cherries on the side!